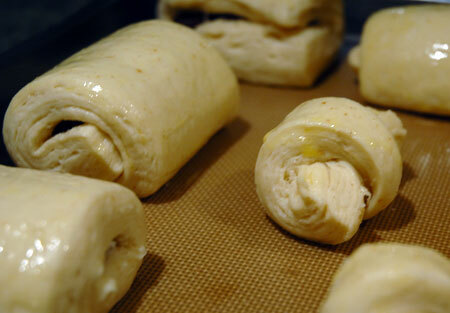 I participated in the Daring Bakers challenges in past years to make Danish braids and vols-au-vent with homemade puff pastry, so I was pretty familiar with the ins and outs of making a laminated dough either with or without yeast. I decided to try two different croissant recipes this time just for fun, starting with the challenge recipe itself and adding a sourdough variant. The two recipes had a few minor differences. For the first, I used coconut oil and a mix of all-purpose and spelt flours. For the second, I used softened butter with my whole wheat sourdough starter and all-purpose flour that had been inoculated with sprouted wheat flour to reduce phytates. 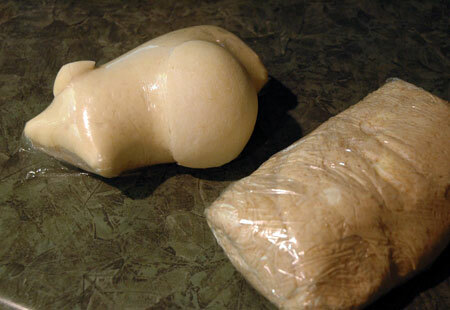 Both needed a little extra flour to achieve a soft, pliable dough that wasn’t unbearably sticky. 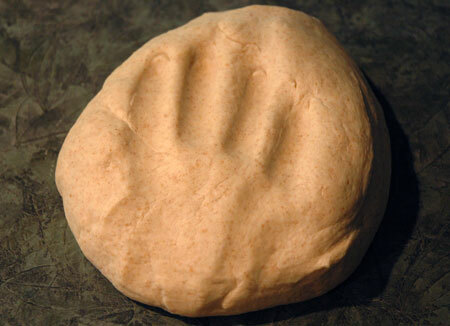 Here is the challenge dough after its second rise. This was some incredibly active yeast! And just to show you that I am not kidding about that active yeast, a comparison shot after the first turn and two-hour rest: The challenge dough busted right through its plastic wrap in the fridge and ended up with some dried-out spots that caused a buttery mess when I went to roll it out. A little extra dusting of flour and it all seemed to work out alright, though; for the next rest period, I deliberately kept the plastic wrap loose, and it didn’t escape again. So far I have just baked the challenge dough into actual croissants. The sourdough variant is in the fridge, and although I will probably bake off a few for comparison’s sake, I plan to roll out and freeze the rest to share with my mom when she comes back from a week with her folks in Ohio. 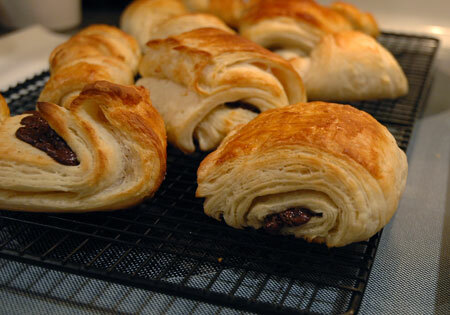 For the current batch, I made a few rectangular pain au chocolat, a personal favorite, using bittersweet Valrhona feves; the rest of the dough was divided into mini-croissants. The yeast was so active that some of my croissants unrolled themselves as they rose, but I consider that a minor issue; otherwise, they came out perfectly, with dozens of paper-thin layers, shatteringly crisp on the outside and buttery soft within. They were a huge mess to eat fresh, but so well appreciated that even my parents’ persnickety cat Addie, who only deigns to eat his kibble and the gravy from certain soft cat foods, stole a bite of croissant right off my dad’s plate. If that isn’t a positive review, I don’t know what is! 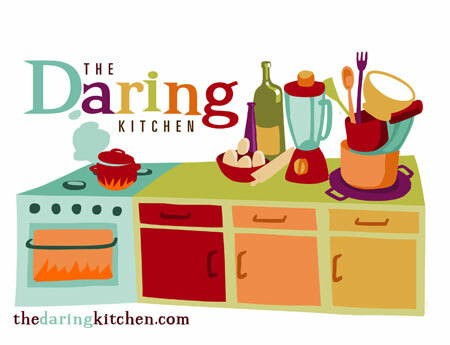 I am a member of the Theta Class of the Daring Bakers, inducted in July of 2007. For more information and a list of my previous challenges, click here. Look at all your fabulous layers! Your croissants look so good! 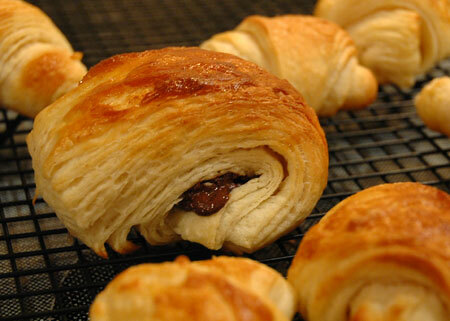 Wow – your croissants look absolutely amazing – you can see all of the gorgeous, flaky layers even from the outside. Can’t wait to see how the sourdough variation bakes up. Really great job. Wow, that is some active yeast! Your croissants look beautiful. Nice job on the challenge! Those stunning layers are amazing I adore all those thin perfectly formed layers astounding I hope the sour dough croissants work out as well. Cheers from Audax in Sydney Australia. Great job on your croissants, they look great! 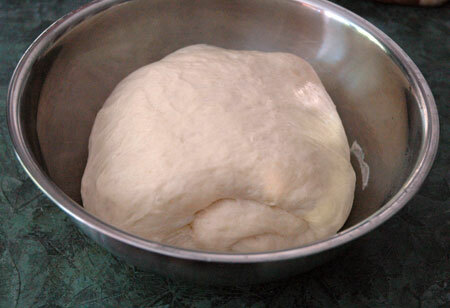 I’m interested to see how your sourdough ones turn out – I just started my very first starter last week and am eagerly anticipating all the things I can make with it!